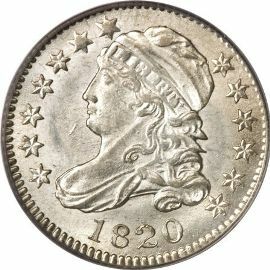 The Capped Bust Dimes (Wide Border) minted from 1809 to 1828 were slightly larger in diameter than those of later years. They measure 18.8mm compared to 18.5mm on coins dated 1828 to 1837. The obverse of these silver coins bears a rendition of Liberty that was designed by John Reich. The design was inspired by Robert Scot's Draped Bust Liberty series. On this coin Liberty wears a cap and is surrounded by thirteen stars signifying the original colonies. Under the entire design reads the date. The reverse of the coin shows an eagle with outstretched wings, clutching an olive sprig and a bundle of arrows. The eagle has a banner above that reads "E PLURIBUS UNUM". Around the entire upper-half of the design reads the inscription "UNITED STATES OF AMERICA", and below the eagle is the denomination 10C. 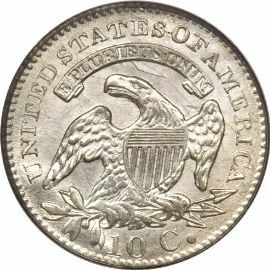 In many cases, a silver coins value is directly related to the prevailing spot price of silver. However, with an older series such as this, the coins value is more in relation to the rarity factor.